A “HAPPY” story and reminder for all – on why you should NEVER GIVE UP!! Reunited ~ after being lost for 7 MONTHS!! 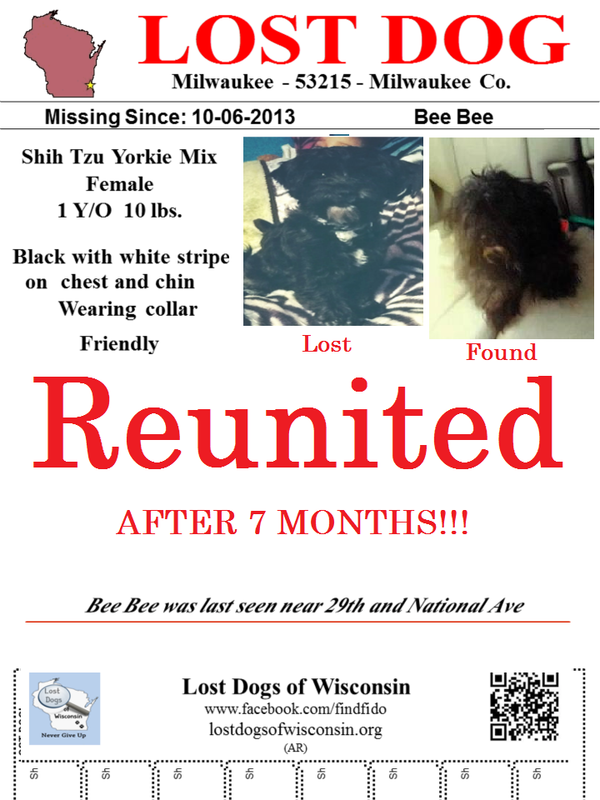 Bee Bee the Shih-Tzu Mix from Milwaukee in Milwaukee County. “OMG! We picked her up today. She was so grateful to see us. She was also severely matted. She is at the groomer right now! Thank you! thank you! thank you! This is a miracle. She was missing since Oct ’13. We pretty much gave up our search, but you did not! My wife is in tears! This entry was posted in Reunion Stories and tagged Flyer, Lost Dogs of Wisconsin, reunion story. Bookmark the permalink.